Many Pure Romance Professionistas reading this have had the pleasure of meeting my favorite Saks Fifth Avenue Personal Stylist and Pure Romance Professionista Stylist, Emily Wall. 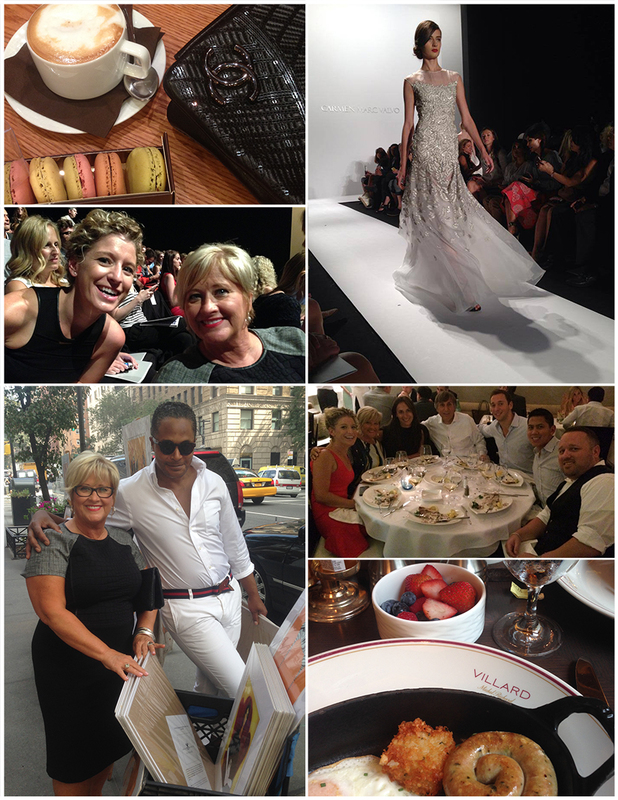 This month, Saks Fifth Avenue surprised both of us with a short getaway to New York City for world-famous New York Fashion Week! Anytime I travel with Emily to New York, it always promises fun-filled days. Although I’ve been to the “city that never sleeps” many times over the years, I continue to challenge myself to stay a student and learn something new during every visit there. It’s not hard to do in a city that is so vibrant and alive with culture, fashion, inspiration and drama. My latest passion is using platforms like Instagram and Facebook to take my family and Pure Romance Consultants “along with me” on every journey. Each photo I take, I think about how it might inspire our Consultants, help our company grow or provide insight to a friend or family member down the road. When we first set foot in New York, we headed straight for my favorite lunch spot, Todd English at The Plaza Hotel. I always order their amazing sushi, and I also shared some of Emily’s gluten free pasta (top of my list on the menu if and when you ever visit there). Afterwards, we returned to our beautiful hotel, Langham Place on Fifth Avenue. I absolutely LOVE this hotel – remember Cheers, when you walk in and everyone knows your name? It was just like this; how every single staff member remembers who you are and greets you every time you walk in is completely astounding. The customer service was unmatched and was truly a home away from home. Another highlight of the trip was a stop by Piranesi (world-famous jewelry “designers for the Stars”) – I’m very proud to share that they are currently designing pieces for Pure Romance as we speak, but you’ll have to wait to learn more! Piranesi owners and husband and wife, Sami and Miriam and their son, and Piranesi designers and engaged partners, Reagan and Teddy, took us to a renowned seafood restaurant called Estiatorio Milos in Midtown Manhattan. The restaurant is famous for its fresh fish, which is flown in from all over the world. The best way to describe it was like having access to a fish market inside the restaurant but WITHOUT the odor. The fish was unlike anything I’ve ever tasted in my whole life! That night when I returned to my room, a surprise was waiting for me: Cincinnati and New York Saks Fifth Avenue stores had delivered a vase of beautiful white roses, my favorite Joe Malone candle and lotion and Christian Louboutin nail polish. I’m often the one surprising everyone so it was a nice treat to walk in to such an unexpected gift. I felt like a giddy young girl again calling Emily, and taking photos of everything to remember the experience. I can’t end this blog without talking about fashion. My favorite show by far was the Carmen Marc Valvo Runway Show. I had runway front row seats and was 15 feet from where they actually walked out to the runway. It literally took my breath away – when I watch Fashion Police in Los Angeles last month, they talked about how runway clothing goes through many variations by the time it hits the clothes racks in day-to-day retail. I could see first-hand how this happens because some of the dresses on the runway were made with sheer fabrics and beautiful raw materials you just don’t see on the street every day. Although the show was at 2:00 p.m., it was just as fun to watch the buzz and crowd bustle around Lincoln Center before the show – fashion-forward people from around the world were gathered together to showcase their creations and there was suddenly a mini pre-fashion show before the real one even began. I also had the chance to visit the St. Johns showroom and enjoy my very own 2015 buying experience. I’m so thankful to Saks Fifth Avenue for this wonderful trip that I will never forget. Sometimes in life, we have to look for new “firsts.” We have to step outside the box and look for experiences that change our lives, no matter where we are in our lives. You have to make things happen and not wait for them to happen. At least a handful times a year, I challenge all of you to try things that you would never imagine, keep a bucket list and then JUST DO IT, because life is short. To have this new experience this past month, I wouldn’t trade it for everything. I LOVED IT! 2 Responses to "New York Fashion Week"
You couldn’t have gone with a more super person than Emily. She won’t steer you wrong. Some day when you are in the store , I would love you to look at Les Copains. Its a great line. Thank you for sharing your experience with us! You deserve to be spoiled!